¶ 1 Leave a comment on paragraph 1 0 I work for a state historical society whose mission is to “share the stories of Maryland preserved in our collection.” This is a fine and even noble goal. However, throughout most of the Maryland Historical Society’s 173 years, its policies and procedures have tended to create gaps of a certain kind. Of course, there are gaps in all collecting. It’s not possible to have everything. Since its founding, MdHS was calibrated to record the deeds of elite companies and families, which means that everyday experiences and even spectacular social or political events have largely been left out of its holdings. As a result, researchers will notice that we do not offer many primary-source materials relating to social protest, especially from the mid-1960s through the 2000s. When library patrons inquire about our holdings on topics like the late ‘60s civil rights or antiwar movements, they learn that not much was collected by the institution after 1960. Our collections are, in many ways, limited to what people give us. Historically speaking, these donors have been people who believe their materials belong in a museum—for example, people with connections to elite families, or collectors and/or companies that have assembled materials produced in the state. This is not to say that everything offered for donation is accepted. 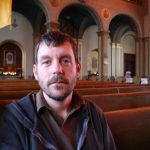 However, collections that come with processing funds and at least one vocal advocate tend to be accepted or given priority processing and other necessary attention by staff. A library committee, consisting of staff and individuals from other institutions around the state, reviews most materials offered. However, as you might guess, this is a slow process. While we do have acquisition funds to purchase items that are important to the state’s history, some of these funds are restricted in precise and often arcane ways that limit what we can do with them. We are aware that all of these factors privilege some histories above others, and we want to take corrective action, so our collection policies are currently under internal review. ¶ 2 Leave a comment on paragraph 2 0 An exception to the processes I’ve described above occurred during the Baltimore Uprising of 2015. On April 12, 2015, twenty-five-year-old Freddie Gray was chased and arrested by Baltimore police. While in custody, Gray displayed signs of serious injury and became unconscious. He was transported to a hospital where he died on April 19, 2015, from a spinal injury. Protests began in Baltimore on April 18 and continued after Gray’s funeral. Local and federal authorities opened a series of formal investigations. Six Baltimore City police officers were charged: four with involuntary manslaughter, and all six with second-degree assault, reckless endangerment, and misconduct in office (among other crimes). In the immediate wake of the uprising, the Maryland Historical Society issued a call for photographs documenting the demonstrations and cleanup efforts. Realizing that the events unfolding around us were of historic significance, and recognizing that social protest was something the institution had often neglected in the past, we decided that we had a perfect opportunity to record and collect history. When we found out others were involved in similar efforts, we reached out and formed a collaborative project that became the Preserve the Baltimore Uprising Archive. I work on the project as a representative from MdHS with Baltimore-area professors, librarians, and archivists who are working both under the auspices of and independently of their institutions. We believe it is a true collaborative effort by professionals to create and steward a digital archive by and for the people. ¶ 3 Leave a comment on paragraph 3 0 Figure 1. 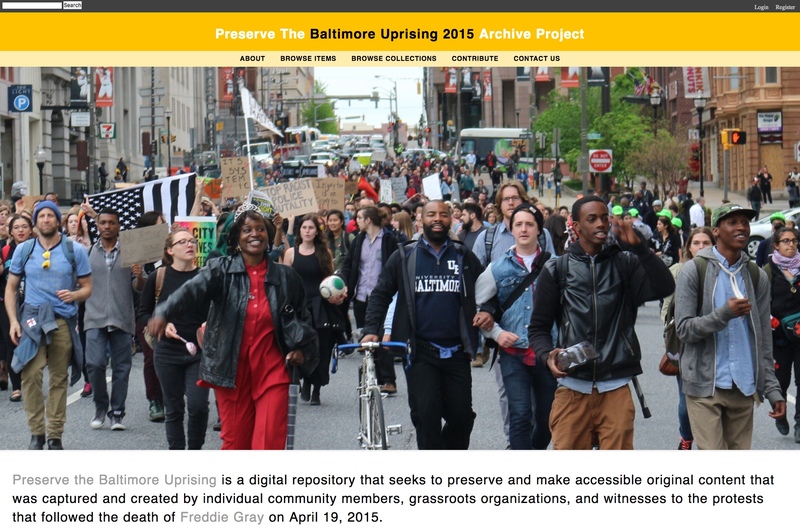 This screenshot shows part of the landing page for the Preserve the Baltimore Uprising Archive. ¶ 4 Leave a comment on paragraph 4 0 The Preserve the Baltimore Uprising Archive collects born-digital materials such as photographs, oral histories, emails, video and audio recordings, and various written accounts. The online collection includes content created by protest participants and observers of all ages and backgrounds. Most but not all are residents of Baltimore City and the surrounding area. Some trained their cameras on protesters, while others trained theirs on law enforcement, military personnel, and military hardware (such as armored vehicles and assault weapons). In some cases it’s possible to determine the contributor’s allegiance or political attitude, especially when they include image descriptions and other information. The addition of oral histories, conducted by project interns with our photo contributors, fleshes out the collection more fully. To date, contributors have uploaded or sent in nearly 3000 items for the collection.